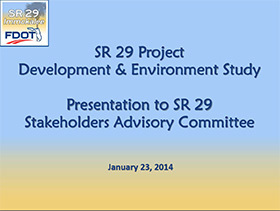 The sixth SR 29 Stakeholders Advisory Committee meeting was held from 5:30 p.m. to 7 p.m. on Thursday, January 23 at the Immokalee One-Stop Career Center, 750 South 5th Street in Immokalee, Florida. Click on the icon below to see the presentation that was shown at the meeting. Please provide any comments you may have on the Send Us Your Comments page of this website.